“Up the Wooden Hill to Bedfordshire.” Words by Nixon Grey, music by Nixon Grey and Reg Connelly (1936). Recorded by Elsie Carlisle with orchestral accompaniment on January 31, 1936. Decca F. 5877 mx. GB7661-1. And Bedfordshire, a cot, where I knelt to say my pray’r. They were happy, happy days for me. The lyrics are an adult’s memory of an idyllic childhood, and especially of the joys of riding on “Dad’s” shoulders upstairs to go to sleep; in short, they are perfect treacle, but perhaps suited to the sentimental tastes of their day. One might compare them to “Little Man, You’ve Had a Busy Day,” but that earlier song is more melodically compelling and has the added bonus of possibly not really being about childhood. 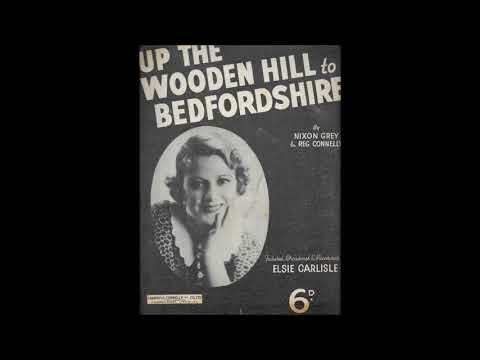 Elsie Carlisle recorded “Up the Wooden Hill to Bedfordshire” at this her last session with Decca (she would not begin recording with HMV until late 1937, but is clear that she was more than busy broadcasting during that hiatus). She breathes a fair amount of life into the flawed composition, palliating its saccharinity with the appearance of sincerity. Vera Lynn also recorded this song, but her organ accompaniment makes the whole affair seem unnecessarily solemn. Elsie’s studio band can be applauded for their more playful approach to the melody; the overall effect is sweet and light.